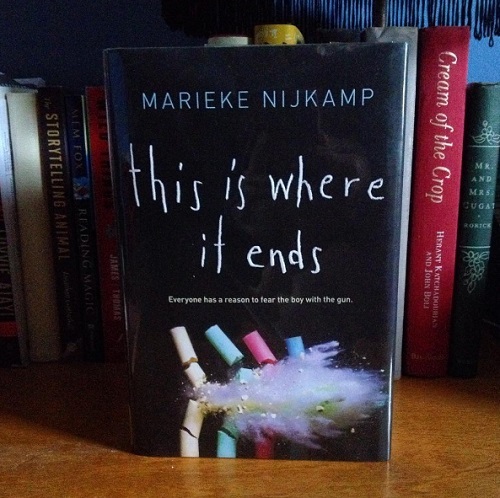 This Is Where It Ends by Marieke Nijkamp is a book about a school shooting. It seems like I've been reading a lot of school shooting books lately... I won't say it's a trend, the way vampires were and zombies are, but I've been reading about it frequently. I like it, though, because there are so many different ways to portray it: from the victim's point of view; from a bystander's point of view; from the shooter's point of view, or all of the above. Plus more. Nijkamp tells the story from the points of view of four different students. They share flashbacks about how they know the shooter, what their relationships were like, how they changed, and why they think this event is occurring. There is the girl who used to date the shooter, the girl who was bullied by him, the bullied girl's twin brother, and the sister of the victim. The way they relate to the shooter, both in flashbacks and during the action, is very emotional. The action takes place in about an hour, starting with a high school assembly. This tight time frame really builds the suspense, especially with four narrators in different areas of the school. For how well the four narrators are developed, the shooter is a flat character. I would have loved to have him as a narrator, to find out why he flipped and decided to shoot up the school. The way he was portrayed was pretty stereotypical, so that aspect of the book was a little disappointing. It's still an interesting, emotional read, if you're in the mood for such realistic fiction. Other books about school shootings I've read recently include: Violent Ends edited by Shaun David Hutchinson, Luckiest Girl Alive by Jessica Knoll, Diary of a Witness by Catherine Ryan Hyde, Damage Done by Amanda Panitch, and The Light Fantastic by Sarah Combs (reviewed for Cleaver Magazine).